The most awaited festival is around the corner … Yes, My friends, you guessed it right! Yes am talking about Holi, the festival of colours. Truly Holi is the festival which everyone enjoys whole heartedly, be it children or elderly. It is the festival which fills colours in our otherwise black & White life, revolving around our responsibilities & daily chores. As a mother, I want my son to have safe & secure yet a very memorable & fun filled first Holi! Am sure there are many other Moms out there sailing in the same boat. To help out my fellow Moms I am sharing some things I am planning to take into consideration. First & foremost important thing to take into consideration is the choice of colours. The colours which are normally available in the market have chemicals in it, which may prove harmful & even lethal to the kids. Hence the use of organic colours is always preferable. Turmeric powder, kumkum, sandalwood powder are few of the things which re easily available in our house & can be used for the little babies. Full sleeved tops, t-shirts, shirts with full length lower / pants are always preferable. This way there will be minimum exposure to the colours. Protect your kid’s eyes, by making them use goggles while playing Holi. Goggles will prevent the colours from getting into your kid’s eyes. Please keep in mind this is necessary even if you use organic colours, as eyes are very sensitive part. Make sure that the goggles are of unbreakable material, as while playing Holi there are chances that kids may fall down. According to me, the ideal time for kids to have fun with colours & water when sun is out … around 10 -11. I know it will be very hard to keep them away for such a long time from their favourite pichkaris & colours… but trust me it is for their good. By this time they will be well fed, with breakfast & weather will be perfect for them to play with water otherwise there will be chance of catching cold. Apply oil / cream which you usually use for your baby’s massage all over his/ her body… also applies oil to hair. This applied oil / cream will form a protective layer on skin preventing or say reducing harmful effects of the colours. Water balloons can prove to be injurious to children as well as adults. My another reason for avoiding use of balloons is that these water balloons are made by filling coloured water in plastic bags, which in a way will cause pollution. Children as well as elders should pay attention to this very important aspect … and that is to avoid wastage of water. You can limit the use of water by deciding before hand, as how much water to be used by each person. According to me one bucket per person or child should be enough. For kid’s it is very important to limit the time period of playing Holi. I know there is no end to having fun with colours… but it should not affect the schedule & most importantly health of the kid. 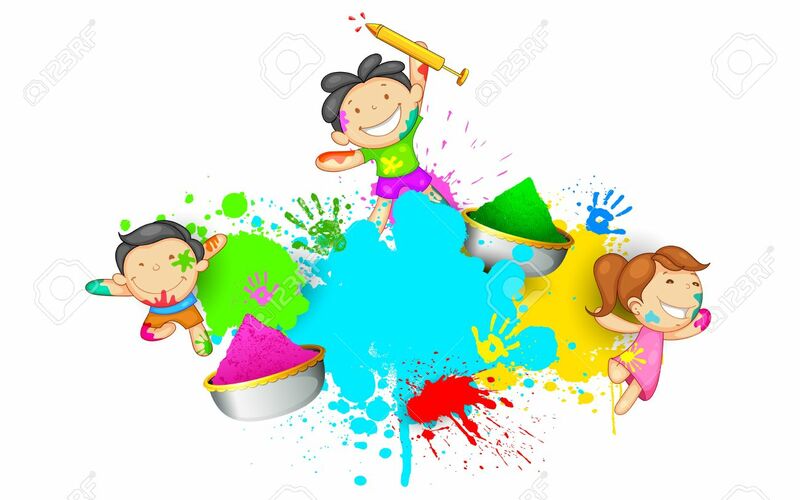 To prevent the colours from spoiling the important areas & things in your house, locality, colony … it is important to limit the area of playing Holi… it may be a playground, backyard, garden etc. The areas of playing Holi for elderly people & children should be kept different, as the colours which elderly people use may prove to be harsh on little one’s skin. Kids should be supervised while they have fun with water & colours. Make sure that they don’t drink the water or ingest the colours, or ingest plastic bags used for making water balloons. Keep the arrangements ready for having bath after enjoying the play. If the colours don’t come off by having a bath… don’t worry, there is easy way for it. Apply a generous amount of baby lotion n wipe it out with wipes. Wishing You a Very Colourful Holi! This entry was posted in Toddler and Kids and tagged Indian baby blog, Indian Mommys Blog, Indian mothers blog, Indian Parenting Blog, indian pregnancy blog, Indian Travel Blog, indian womens blog. Bookmark the permalink. This is an informative article and in light of today’s time and needs. The ingredients of holi colours have changed over the last couple of years. Organic colours seems to be working so far. If one wants to play decent holi with colors, I think gulaal made from besan is also enough but yes, if you want to indulge in Holi madness where people like to dump others in marshes or paint them with silver and gold colours than any suggestion would not be worth trying.